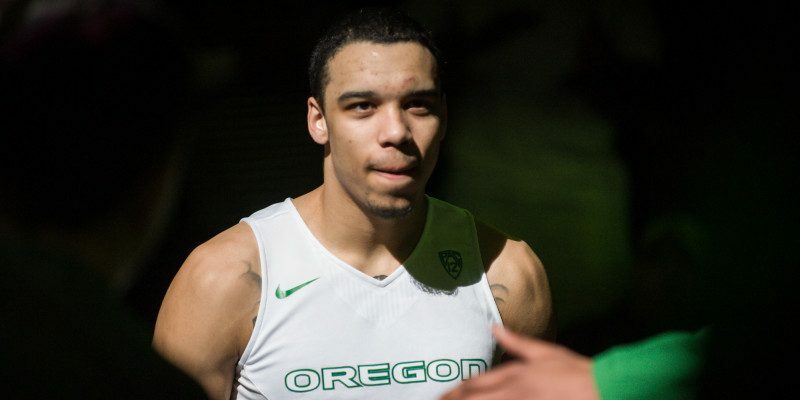 Dillon Brooks scored 19 points and pulled down eight rebounds, Joseph Young added 14 points, and Elgin Cook put up 12 points of his own to help the Oregon Ducks come out on top in a 69-58 victory over the No. 9 Utah Utes on Sunday afternoon. 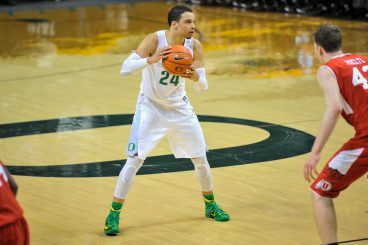 The Ducks (20-8, 10-5 Pac-12) came into Sunday’s game fighting for their NCAA Tournament lives, and after Young guaranteed a spot in the famed tournament last week, the pressure was on Oregon to protect its home court in the final home game of the season. The Utes (21-5, 11-3 Pac-12), however, have been one of the most dominant teams in the nation all season long, and they are currently in second place in the Pac-12, just behind No. 7 Arizona. In the most important game of the season, waves of green and yellow filled Matthew Knight Arena, and the atmosphere in the building was unbelievably electrifying. The ruckus crowd, however, did not faze the visiting Utes, and they countered Oregon’s home court advantage by playing solid interior defense. Utah turned its defense into offense and it jumped out to an early 7-2 lead. Despite the Utes’ quick start, the Ducks impeded Utah’s offense by rotating well defensively, which led to double teams and forced turnovers. Utah’s inability to organize its offense led to easy opportunities for Oregon, and eight of the Ducks’ first nine points came inside the paint. The score remained close throughout the first half, and the first 15 minutes of the ball game resembled a sloppy and scrappy tug of war match. Neither team managed to pull away from the other. However, with about five minutes remaining in the first half, Oregon picked up the momentum. A layup by Young gave the Ducks a 21-19 lead, and then a quick Utah turnover led to a three by freshman guard Casey Benson, giving Oregon a 24-19 lead. The Ducks ended the first half on a 13-8 run and the ducks walked into the Locker room with a 32-27 lead. Joe Young finished with 14 points and four rebounds. Young finished the first frame with only four points and six of his first eight shots were off the mark. But his teammates stepped up and six other players combined to score 28 points, including eight points from Cook. Oregon started the second half with a five-point lead, and, possibly, its season on the line. Senior Jalil-Abdul Bassit put the Ducks on the board to start the second half with a three-point basket, but Utah answered Oregon’s quick jab with a three of its own. The Utes compiled 11 turnovers during the first 20 minutes, and they had a hard time holding on to the basketball to start the second frame, as well. Oregon held a 39-36 lead with about 15 minutes to go in the ball game, but two straight Utah turnovers gave Oregon a 43-36 lead. The slugfest continued, though, and the Utes constantly found themselves within striking distance. Dillon Brooks led the way with 19 points and seven rebounds. However, the star on senior day wasn’t Young or Abdul-Bassit. It was a freshman that took center stage. With six and a half minutes left in the game, Brooks connected on a jumper from the left wing to give the Ducks a five-point lead, but the youngster wasn’t finished. He proceeded to score nine straight points, which was capped off by a thunderous two-handed jam. Brooks’ theatrics in the latter portion of the ball game sealed the victory for Oregon, and his 14 points in the second half led the way. Considering how important this game was for the Ducks, they chose a great time to bring the defensive intensity. Oregon held Utah to a 32% shooting mark in the second half, and the Utes were also out-rebounded by nine during that time, as well. It’s no secret that the Ducks needed to protect their home court this week, and with three road games remaining on the schedule, Oregon controls its own destiny. But Sunday afternoon was a bittersweet moment for both Young and Abdul-Bassit. They both understand that the season is far from over, but they’ll never forget the memories that they have created at Matthew Knight Arena. The improbable run continues for Oregon.